Every day you come into contact with potential referral sources. How do you ensure that they remember you? Insight in Motion is a comprehensive legal newsletter and blog content publication and distribution system which fosters long-term connections with clients and colleagues to guarantee you’re kept in mind when business opportunities arise. Each year, millions of individuals and businesses turn to the web to find and qualify law firms. It’s imperative that your law practice have a commanding web presence that resonates with visitors and propels them to action. Zola Creative has over 10 years of experience developing compelling websites for law firms and helping them generate massive visibility. The Zola team has specialized knowledge and tools which will help you develop a website to achieve your personalized goals, whether you want to attract new clients or build a reputation among colleagues within your area of practice. izmoLaw offers Search Engine Optimization Services to take action to outrun the competition and get the top position in search sites. We call it our "Escape the Bear" package. The story is: Two hunters anger a bear in the woods and it starts chasing them. As the two run for their lives, one says, "It's hopeless, we can't outrun the bear!" The other replies, "I don't have to outrun the bear, I just have to outrun you!" • Are potential customers not finding you online because you don’t have a website ? • If your legal practice does have a website, is it not displaying correctly on smartphones or tablets ? • Does your website not come up in the first few search results when potential customers are looking for your category of practice online ? If you’ve been relying solely on word-of-mouth or the phonebook to attract customers because your firm doesn’t have a website, or your website is out of date by today’s standards, chances are, you’ve literally been sending your customers to your competition. Don’t go another day without a mobile-optimized website for your practice. There is no faster, easier, or more effective way to get your business online than izmo. As one of the top insurance firms in America*, Paychex Insurance Agency has the plan types and carrier connections to make it easy to offer and manage a group health plan for your employees. Paychex Human Resources offers scalable, easy-to-use human resource solutions and personal access to a dedicated HR professional, available on call or on site. Paychex offers flexible 401(k) plan design, recordkeeping, and plan management services. Use our deep retirement services knowledge and expertise to help you select and manage the right retirement plan for your business. Paychex Flex is all about choice. Whether you prefer to report payroll information over the phone or email, or process payroll yourself using our easy-to-use cloud platform, our intuitive technology and flexible service options will free you to focus on what you do best — running your business. Two Editions: Both editions include highly accurate scan and automatic formatting of the TOA, and BA’s unique split-screen, color-coded draft review, where you can quickly compare each line in the TOA to citations in the document. Accuracy: BA is consistently more accurate than any other software or method. Remarkable Speed: A 50-page document will scan in 10-15 seconds. 235 pages with 4,000 citations scans in less than 2 minutes. TOA Preview with Instant Update: See an image of the finished TOA. In Premium, updated live as you edit the TOA. Citation Revision Tracking: Quickly identify citations added, changed or deleted due to author revisions. Powerful Search Function: Instantly locate citations by text or other attributes. Proofing: Citations are color highlighted in the document and are easily compared to the list in the Review Pane and TOA Preview. Editing: It is simple to edit citations in the document. In Premium, make permanent changes to the TOA’s text or formatting with a familiar Windows functionality. Premium Edition is suited to a firm that prepares complex or frequent TOAs, or requires network administration. The Advanced Editing Features allow you to make permanent editing changes only to the TOA almost instantaneously in the TOA Preview or in the Review Pane. Last minute changes are incorporated into the document without any stress. There is a built-in discount for medium and larger firms; training includes two one-hour classes. Light Edition is perfect for small firms preparing a low volume of TOA’s. You can make permanent corrections to the citations in the document, but you make your TOA changes in Word, after you generate the final form of the TOA. You can begin with BA Light, and upgrade at any time without penalty. Light costs less and requires just 45 minutes in training. Attorneys & legal professionals everywhere trust BillQuick as their integrated business solution for time tracking, case management, billing and accounting. They use BillQuick to streamline their day-to-day tasks while improving work performance and productivity. BillQuick is designed to include significant industry specific features that allow you to make more informed decisions and efficiently manage your matters. Conveniently track time and expenses from your mobile phone, desktop widget or online. Make missing time entries a thing of the past! Create professional invoices by customizing the design in minutes. Email invoices and accept payments to assist in getting paid faster. Keep up with your clients and projects and everything that makes them unique. All your information is now in one easy, secure location. Generate reports with one click and easily export to other programs. Cross reference your documents to stay on top of your business! 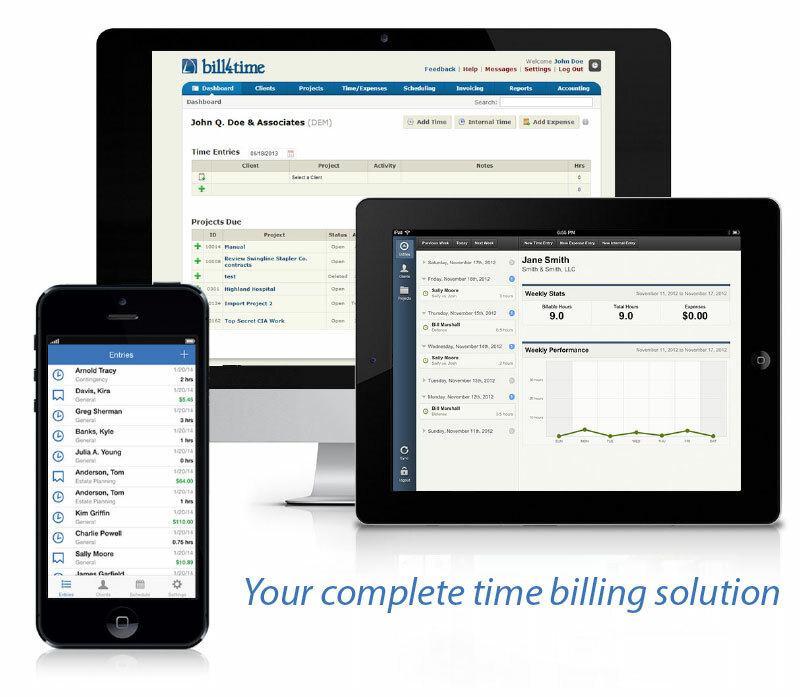 Bill4Time's legal billing software was built with the guidance of lawyers. Our features include full 128-bit data encryption, local date backup, trust accounting, multiple client billing rates and options, great practice management features, powerful reporting options, and much more. For a limitd time we'e offering a free session of eDepoze. • *$400/month for unlimited use and receive a new iPad Pro. Prepay for 10 depositions and get a new iPad Pro. [Click here to redeem.] *Our annual subscription includes unlimited use for depositions as well as witness prep, arbitration, mediation, hearings, and trials. $500 per entire event for the taking attorney. *Our annual subscription includes unlimited use for these event as well as depositions, witness prep, hearings, and trials. $100 per event. *Our annual subscription includes unlimited use for this event as well as depositions, arbitration, mediation, and trial. In trial, present and distribute exhibits during opening statements, when examining witnesses or during closing arguments. In hearings, present exhibits and case law to the judge when arguing your motion. $500 per entire event. *Our annual subscription includes unlimited use for these events as well as depositions, witness prep, mediation, and arbitration. *Annual subscribers get a discount. Sage Timeslips makes it easy to capture more billable hours and expenses and deliver more accurate and timely billing to clients. It integrates with popular accounting software, such as Sage 50 Accounting US and QuickBooks, as well as Microsoft Outlook and practice management solutions such as Time Matters and Amicus Attorney. Features include Automatic Time Capture, drag and drop reporting and billing customization, 100+ pre-defined reports and calendar sync. Web-based time and expense capture is available.